Project management is not an easy job. In fact, it’s several not-easy jobs, including the initiation, planning, executing, controlling, and closing of a project. Even more difficult, that project is delegated to a team of your choosing, given specific goals to achieve over a defined timeline for a determined budget. And you have to do all that successfully. To do so, the best project managers use robust project management tools to keep all aspects of their projects organized. 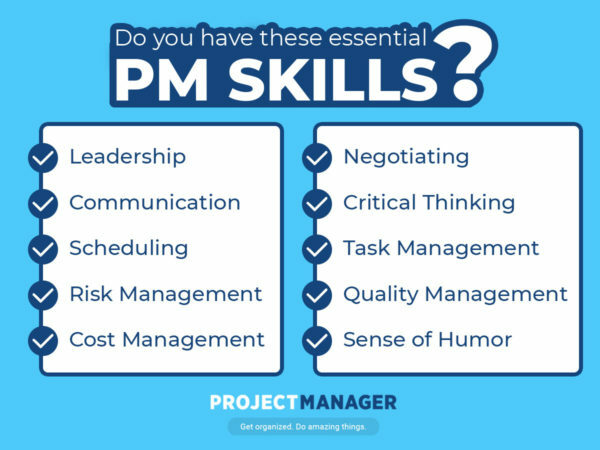 Still, that’s a lot to ask of any one individual, but project managers have a variety of skills to get the job done. These include the technical, business and management skills you’d expect, but also a number of soft skills. Project managers aren’t only dealing with systems and processes, but also people. When you boil it down, successful project management is built on creating and maintaining strong relationships across the organization. But that’s just one aspect of the project manager’s many faceted job. Below we’ve collected the top 10 skills every project manager should have. There are certainly more than just the following 10, but if you have these, you have the foundation on which to build a successful career in project management. Now we’re starting to get into some of the hard skill sets required of project managers, and few are as essential as knowing how to create a project schedule. The only way to achieve the goals of the project within the timeframe that has been decided on is to breakdown that goal into tasks on a timeline. That’s scheduling, and it’s the heart of what a project manager does: setting up a realistic schedule and then managing the resources to keep on track so the project can be successfully concluded on time. There are many tools that can help with this process, chief among them an online Gantt chart, which provides a visual of the schedule with tasks, durations of those tasks, dependencies, and milestones. Doing anything is a risk. Planning a project, big or small, is inherent with risk. It’s part of your job to see those issues before they become problems. Therefore, before executing the project, you have to put in the work to identify, assess, and control risk. The more you can manage risk, the more likely your project is going to succeed. Of course, you can’t anticipate everything that might happen over the life cycle of your project. There will be unanticipated issues that arise, so you need to have a process in place to handle those when they come up. You can’t do anything without the money to pay for it. You have created a budget. Your first job is to make sure that budget is realistic and can meet the financial needs of the project, and, secondly, controlling those costs through the execution of the project. This is easier said than done. Unless you are lucky and work for an organization with unlimited funds, you’re going to have certain financial constraints, and more likely, be given a very tight budget. It takes a great deal of skill to figure out how to squeeze every cent out of those limited funds. Being good at negotiation is sort of a subset of communications, but it deserves its own space here. Negotiation isn’t merely haggling for the best price from a vendor or contractor, though that’s certainly part of it. Leading a project means you’re in constant negotiations. For example, you’ll likely get demands from stakeholders that can impact the scope of a project. You’ll have to give them pushback, but diplomatically, so all parties concerned feel they’re getting what they want. Then there’s the inevitable conflicts that will arise among team members or other people involved in the project. If you’ve got strong negotiating skills you can resolve these disputes before they blow up and threaten the project. Project managers aren’t the only ones who could benefit from this skill. Most of us are not thinking, but reacting and following a series of responses that we’ve either been told or learned. It’s not such a bad thing. You can sometimes be on autopilot, but you better know how to switch it off. Critical thinking is simply being as objective as you can in analyzing and evaluating an issue or situation, so that you can form an unbiased judgement. It pulls you out of acting on emotions or from received knowledge, and isn’t that what a project manager must do? You’re faced with problems every day when you’re working on a project, and you want your decisions to be impartial. The only thing guiding your decision should be what’s best for the project. Here’s another one of those technical skills that should be stamped onto the DNA of every project leader. If scheduling is bedrock to project management, than tasks are mortar that holds everything together. There are going to be tons of these pesky little jobs for you to create, assign, and manage – some of which will be dependent on others, meaning that mismanagement of this process can severely impact the success of your project. You can look at this as making a super to-do list, which is not entirely wrong, but as you add complexity you’ll also want to add the tools to help you manage these tasks more efficiently. You’ll want features in your task management tool that foster collaboration with your team, help you prioritize and give you instant status updates when tasks have been completed or are running behind. Most of these skills are obvious, right? Well, they are the top 10 project management skills. But quality management is one that is often overlooked by project leaders, and it’s one that needs to get more attention. Quality management is overseeing the activities and tasks that are required to deliver a product or service at the stated level indicated in the project paperwork. Sound familiar? It’s basically a part of your job that you might never have given a name to or worse, you’ve been neglecting in favor of meeting deadlines. Staying on schedule is important, but that schedule is pointless if it produces something that is subpar. No, really. You don’t have to be a comedian, and certainly there’s a time and a place for humor, but a sense of humor might be one of the most essential of the skills on our list. That’s because a sense of humor is really about having a different perspective. It allows you to see a problem differently. Humor relieves stress for you and your team, and only when tensions are lifted can smarter actions and ideas show themselves. A sense of humor also helps with morale. You’re going to work as hard as your team, but that doesn’t mean the environment you’re working in should be stifling. You can set or at least influence the culture of the workplace, and a lighter mood rises all ships. You can have all the skills in the world, but without the right tools you’ll still be working at a disadvantage. Luckily, there are tools that enhance your skillset and make you even more efficient and productive. ProjectManager.com has features to help schedule, manage tasks and budget your project, as well as being online so it’s great for team collaboration. You’ll have to bring the sense of humor, but we’ve got the rest. Try it for yourself by taking this free 30-day trial.